- Can you tell me about the project you did for this event? This project is a continuation from what I started last year at a residency in the White Building in Phnom Penh, then developed further in Koganecho in Yokohama. Chee Wai, the Director of Asian Music Network asked me to do something for this occasion, so I decided to make the next iteration of the project. I want to do something that involves many different kinds of people, including the audience. For this project we build a bicycle together through a workshop. Usually a bicycle is for moving between places, but we build a moving musical instrument together. I have always been interested in the idea of a public instrument or public sound. In Thailand, when you go to temples there are many sounds. There are public instruments that anyone can play freely. You are never sure if people are playing music or praying, but there is a certain sound that exists. For me, this free sound interests me more than music that is completed. I am always looking for how I can make sounds like this. At the same time I also want sounds that anyone can enjoy. - Can you also show me the bicycles you made? This one is a prototype that I made for the Saitama Triennial workshop. This is one example of how you can make sounds very simply from the bicycle, and it can be implemented easily by the workshop participants. This is made out of a CD - something that you can find anywhere. By attaching it to the wheel you can produce sound. The mechanism is very simple but what is difficulty is to find the most effective location on the rotating wheel for making sound. - Is there video footage of how you are making it? Yes, anyone can watch it. - And this bicycle is left outside now. Yes, because we are coloring it now. - And these are intended for people to ride as well? - I see in the image that you are making sound while you ride around town. This is just one example. The final result changes based on the workshop participants, but the goal is to make sound while actually riding the bike. - That is amazing! What is this on here? - What kind of sounds does it make? Just the original sounds inside the keyboard. We change the setting so it doesn't just play "Do Re Mi Fa So Ra Shi Do" but when you push one button it plays another sound. The setting on the circuit board will change how the sounds respond. If we make one button that plays Do, and another that plays Mi and have about four of these it is enough to play freely. I am more interested in how people can play together rather than what kind of sounds it makes, so that is why I set it up like this. - This goes the bicycle too? - What part of the bicycle to you put it on? - How do you envision working with the people of Omiya city? I am going to give them CDs to cut up and make gears out of. - That was what was spinning in the video that we saw earlier? Exactly. In the workshop the participants try to figure out where to put these on. - Can you play the CDs after you alter them in your workshop? No, but you should try it! I doubt it will work! - What is this place we are in now? I am thinking of bringing the bicycles in here to work on. We have two that we can use. - Could you tell why you started making work like this? I don't know why, but since I was young I liked to sit down by people who were talking or doing something. I liked to listen to people talking or various sounds that they made. Perhaps I am making work to understand this. I enjoy siting down and listening in to something. Even when I lead workshops, my favorite moment is to listen to the results at the end. I would like to just sit down and listen to new sounds born out of people who had just met, performing together. - You have studied fine arts rather than music. What made you shift to this field? I don't really think I have changed my focus or that I have moved from fine arts to working with sound. I have always been working with sound. I was interested in how my art can work together with sound, and how they can enhance each other. I realized that this was my interest and I started to think of why. The current shape of my work is a result of reflecting on this, and it's not a shift or change of focus. I just observed myself and followed what I was interested in - as a result it has changed my work. - You have also lead workshops not only in Japan but also in Canada and other countries outside of Thailand. Are there challenges or things that you are careful of when you teach? I have never thought it was difficulty to work with people from another country. I am interested in people of different backgrounds and different cultures in general, and of course it is difficult for me to understand the meaning of the languages, but that allows me to appreciate the words as purely sounds. I am inspired to make new work from listening to the sounds of words when I work abroad. - Each country has there characteristic and even if you ask them to do the same thing the result may be very different. What are your thoughts on this? Yes, the response varies between each culture, and sometimes that is a challenge for me. However, I have learned form doing residencies in many places, that that boils down to the basic problem of figuring out how to truly connect with the local community. It was like this when I was in Phnom Penh. It was difficult because I didn't understand the language and the culture was different. But I was able to connect through sound, and this is very important for me. 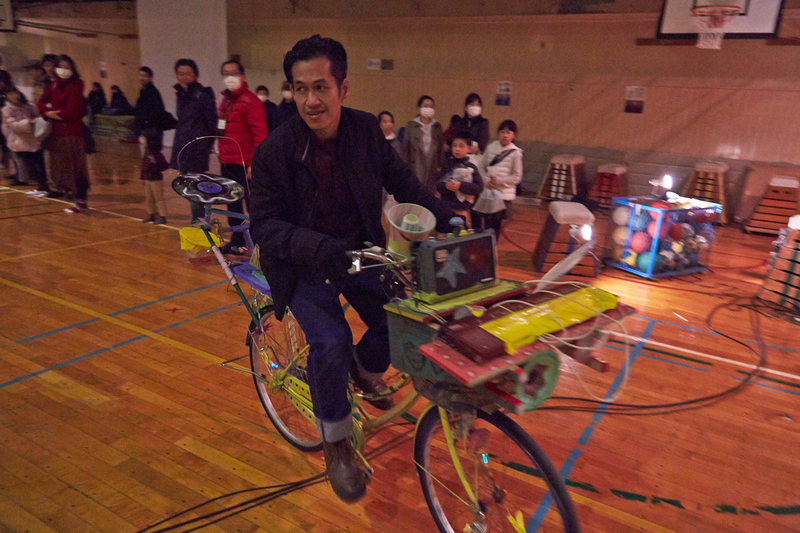 When I was in Koganecho I made a sounding bicycle and rode it to many public places. When you perform a bicycle that you made yourself and perform it in a public space many people gather, and in the end people who had just met will all join in to perform together. If I can connect with local people like this, I consider this a success, and that is the challenge that I take on each time. - Can you tell me about other projects that you are involved in? I have a community project in Chiang Mai. I am co-director with a friend and we work with people, not only artists, whom are interested in sound. We organized various workshops, events and concerts. - When did you meet Otomo Yoshihide? Ensembles Asia Directors Keiko Arima contacted me and my friend Pik to do something together in Chiang Mai. So we came up with the idea of Sunday Market Orchestra and Otomo was part of it. He also led a workshop when he came to Chiang Mai. - Did the project go well? We only had three days for this project. The first day Otomo came and gave a presentation and the second day we did the workshop. On Sundays there are many markets held in Thailand, so on the third day we made an impromptu parade, kind of like a happening. Many Sunday Market Orchestras were formed on the spot including participants from Otomo's workshop, and performances would suddenly start. We also incorporated some indigenous drums. - By the way, I really like music from Thailand, especially Mor lam. Do you listen to this kind of music? Yes I love Mor lam, but I also listen to every kind of music.